This portable hand steamer is perfect for the travelling business bod, or indeed anyone who has ever tried to borrow an iron at a hotel. We’re HUGE fans of T3 magazine in our office. It’s a bit blokey, but hey! We can be blokey too! It’s not all about steaming flowery blouses (but it is a lot about that, we love steaming flowery blouses). 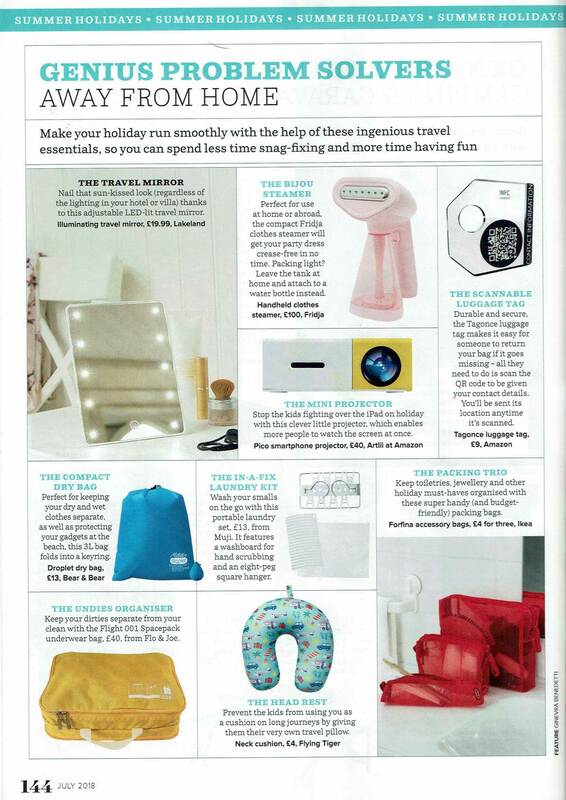 ANYWAYS, T3 has done a huge article on the best irons of 2019, and our f10 handheld clothes steamer has made the cut! This portable hand steamer is perfect for the travelling business bod, or indeed anyone who has ever tried to borrow an iron at a hotel. You know the scenario. Either another guest has already nabbed the only iron in existence or the iron they’re able to loan you resembles something your great-grandma might have used. And then there’s the hassle of trying to fit the ironing board in the tiny space between the end of the bed and the obligatory writing desk that no one ever uses. Frankly, I never expected this product to make much impression on my heavily creased, hand-held T-shirt but blow me down with a feather if it didn’t remove all the creases without the hot metal plate even touching the fabric. It did so very quickly, too, and without producing any significant amounts of steam; certainly nothing like the geyser-like blast of your average bog standard iron. The lightweight Fridja takes about 45 seconds to warm up and is capable of providing up to 14 minutes of continuous steaming. 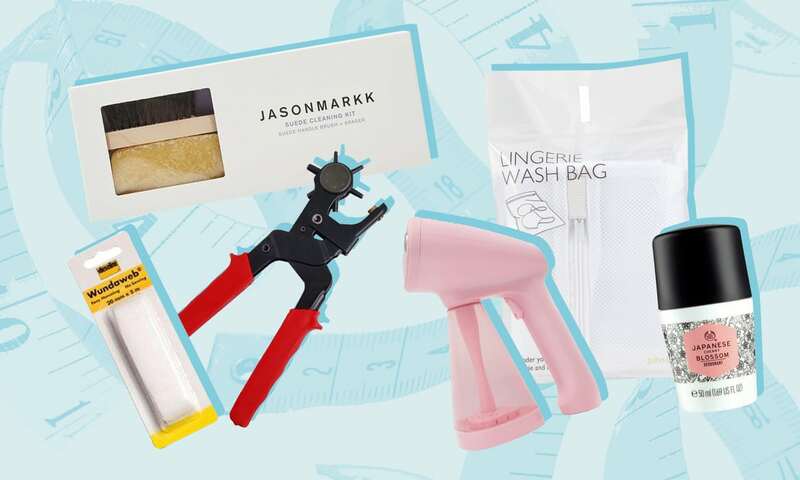 The whole system is comprised of a hand unit, a 260ml water tank, a flat plastic collar stiffener, a collapsible clothes hanger, a soft fabric guard for delicates and a nice velvet pouch to put it all in. In a stroke of minor genius, it also comes with a space-saving adaptor that allows you to use any standard plastic drinks bottle instead of the main water tank. 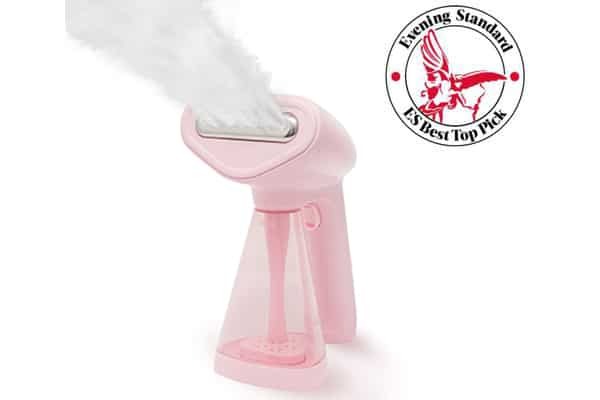 Best handheld steamer for clothes. Best handheld steamer for clothes. The best handheld steamer for clothes! Let that just sink in (you and the SEO). I was innocently browsing the internet, googling Fridja, and low and behold I found this article, from six months ago. Oops. 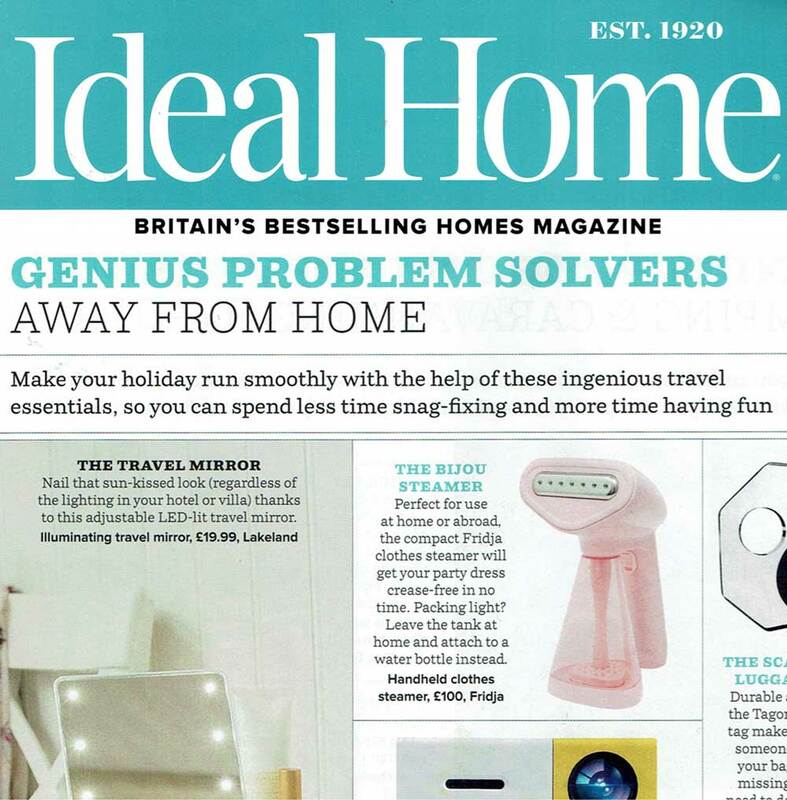 “Forget ironing – these days, it’s all about the clothes steamer”. 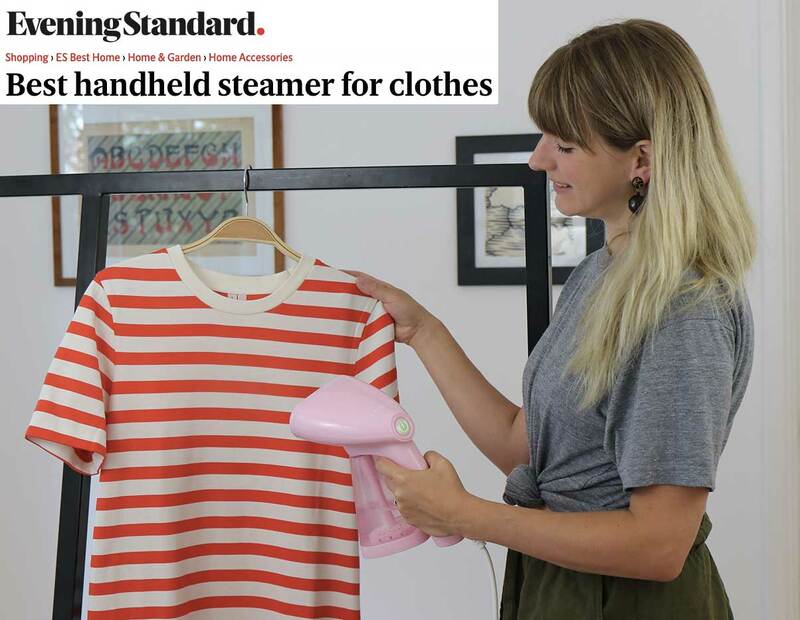 The Evening Standard ran a piece highlighting the best handheld steamer for clothes, and our humble f10 handheld clothes steamer, has seemed to have come top bill! It’s even earned itself a pretty stamp, check it out! If aesthetics are important to you it doesn’t get much cuter than the Fridja F10, which comes in black, white or pink. Taking only 45 seconds to heat up, it makes quick work of crumpled clothing – especially as the steam jet can be held down continuously for up to 14 minutes. The handle is slim and the model is light, making it easy to manoeuvre around garments and the chord stretches to almost two metres, which is great if your plug points are in awkward places. Add-ons such as the delicate fabric guard and collar press come in handy whilst the anti-calcium water tank gave us assurance that the product will is durable. Though one of the pricier products on the list, all these factors add up to make it a favourite. Here our wonderful super babe is sporting a Gigi (pink), but the f10 is available in Erin (white) and Raf (black). 1. After you have allowed your steamer to fully heat up, test it on a kitchen towel first to prevent any water sputtering all over your clothes. And always steam in a vertical position! 2. Be aware of the type of fabric you are working with. Silk should be steamed from the reverse side to avoid water streaks and velvet should never touch the face of the steamer. 3. Use distilled/deionized water to fill your clothes steamer. Hard water minerals found in tap water such as calcium and magnesium can clog clothes steamers and decrease their overall effectiveness. Distilled water is readily available from most grocery stores and costs about £1 for 2.5L. 4. Clean your clothes steamer with white distilled vinegar. Fill the tank with the vinegar (white distilled only), allow to heat completely then push all the steam out into your kitchen or bathroom sink. Repeat with distilled water to remove any trace of the vinegar and voilà, a good as new clothes steamer. Thank you so much Evening Standard! What an amazing article – you can read it here. 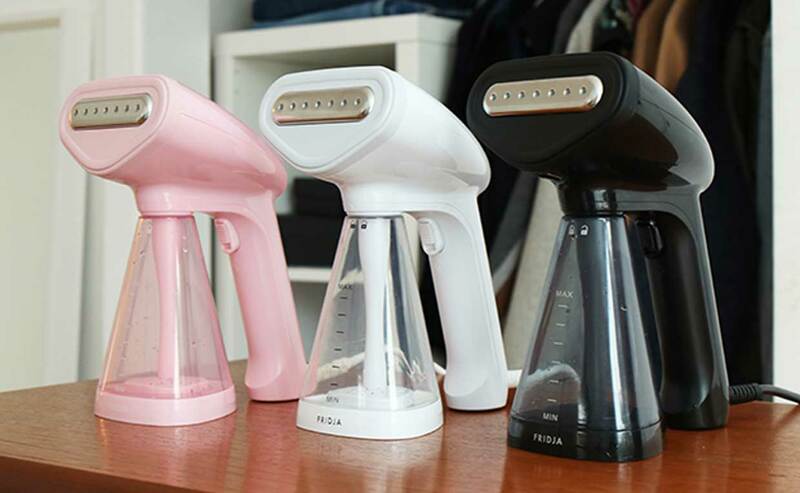 To watch an overview of our f10 handheld clothes steamer, just click below! I really thought Christmas was over. Turkey, crackers, jumper, over. Then Vogue Edit goes and gives us the best present ever. Ellie Pithers, Fashion Features Editor (who we’ve all suspected in the Fridja office to be an actual genius), writes in the Vogue Edit her choice to buy, browse and crow over. 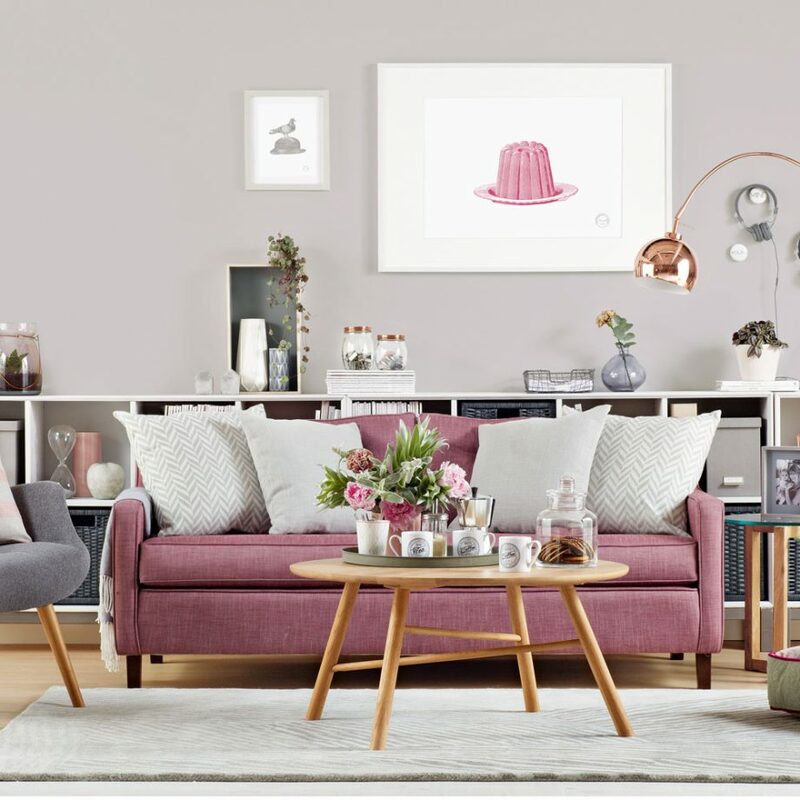 A cool collab to check out here, some amazing interiors here, and our very own Fridja f10 handheld clothes steamer. Start your year crease-free, people! 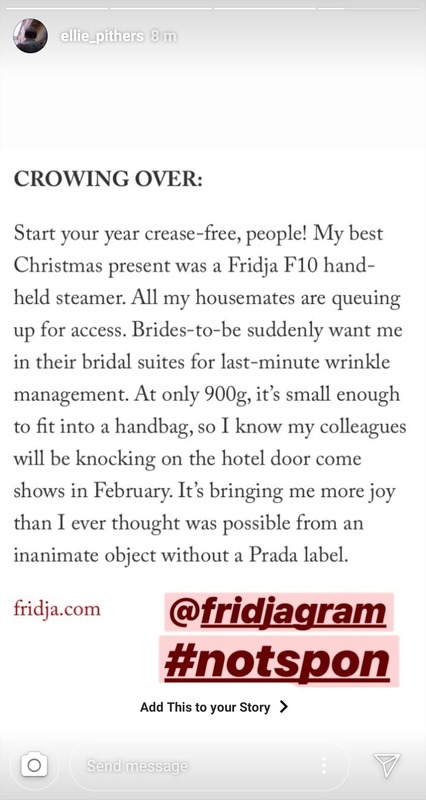 My best Christmas present was a Fridja F10 hand-held steamer. All my housemates are queuing up for access. Brides-to-be suddenly want me in their bridal suites for last-minute wrinkle management. At only 900g, it’s small enough to fit into a handbag, so I know my colleagues will be knocking on the hotel door come shows in February. It’s bringing me more joy than I ever thought was possible from an inanimate object without a Prada label. 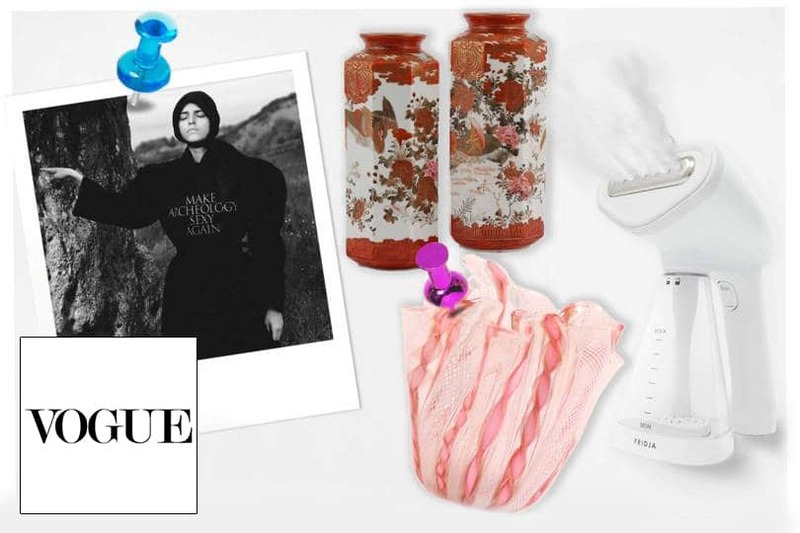 Thanks Vogue! Very kind of you, especially at the end of the first week of January. The week that everyone feels fat, broke and cold. You’ve warmed our hearts. Check out The Vogue Edit here, and follow Ellie’s Instagram here. 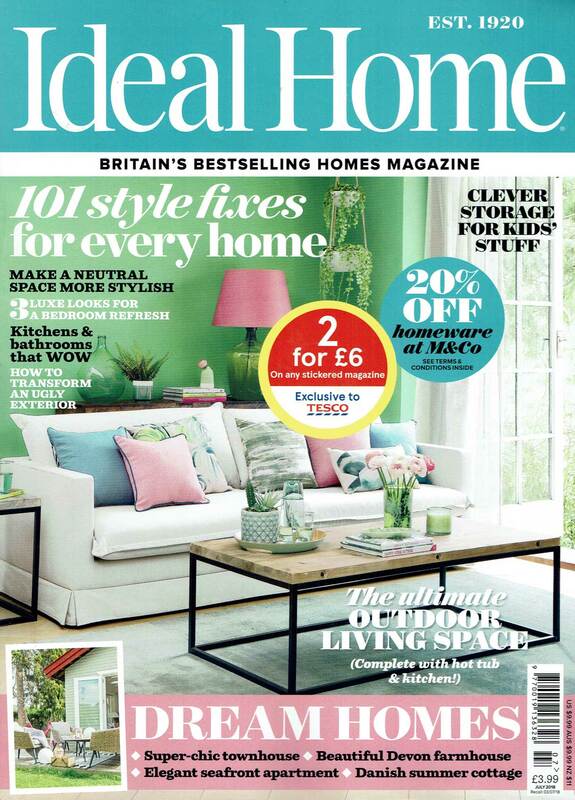 Good Housekeeping Magazine is like that tough kid at school that took a liking to you. A long-standing established character that luckily thinks you’re okay. Or in this case, thinks we’re okay. 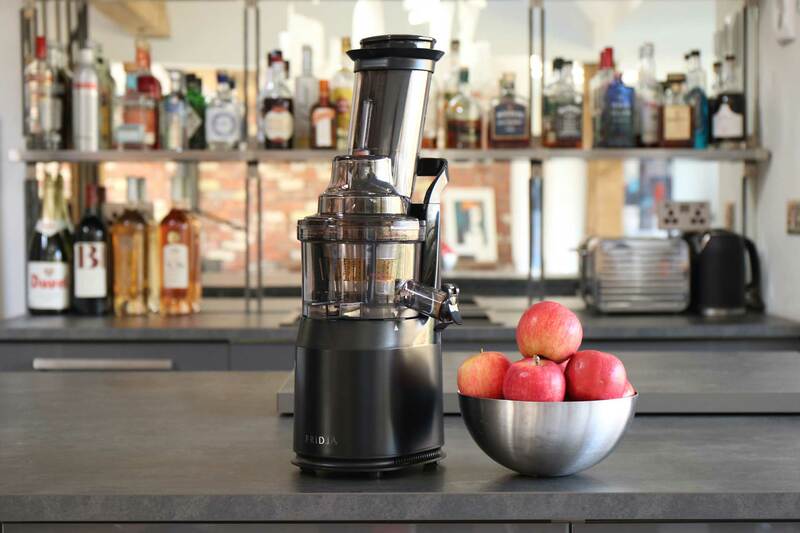 They’ve been very kind and awarded us 74/100 for our latest juicer! I can tell you at the time of writing this, I (humble narrator) has never scored 74/100 for anything at school. Anything above a 70 is technically a first at Uni, so we are over the moon! Check out the full review here. The latest addition to Fridja’s juicer range, the F1900 Whole Fruit Slow Juicer offers an aesthetically pleasing design which is straightforward as well as convenient to use. It features a wide three-inch feeding chute, which allows apples to be added whole, and a single speed for juicing. Overall, we found that it produced a decent amount of juice with very little froth – particularly excelling when juicing berries. It’s also very speedy, needing less than three minutes to work its way through a kilogram of ingredients. However, it’s worth noting that it comes with a steep price tag and so won’t suit those shopping on a budget. They do rightly point out that our juicer is not cheap. Stainless steel material and tough motors do not come cheap. However, we have now price slashed our Fridja f1900 Whole Fruit Juicer from £249.99 to £149.99, including free delivery across Europe! 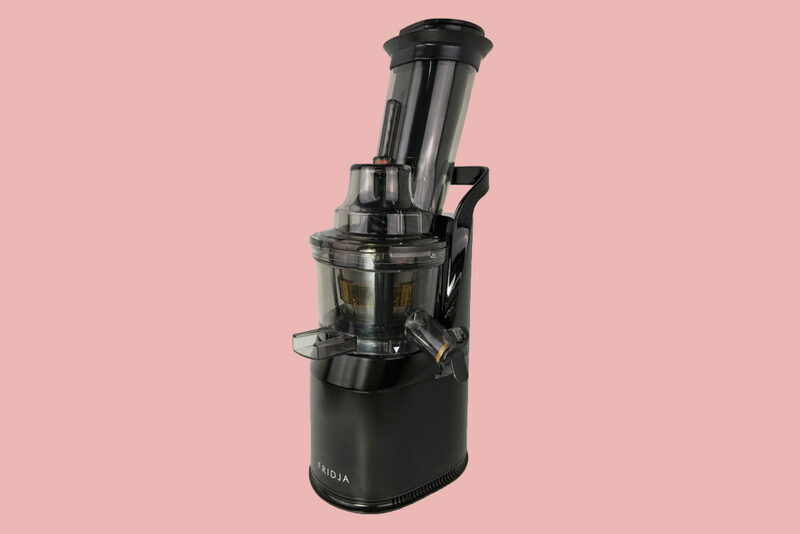 Click the gorgeous juicer below to head to the purchase page now! Or click here!